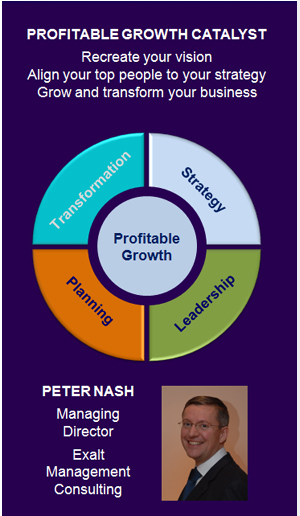 Our director Peter Nash has over 15 years experience in blue chip management consulting at The Boston Consulting Group and lately as a Partner at Accenture. He has extensive experience of vision and strategy definition, having defined over 25 commercial strategies. His work includes vision and strategy definition for companies, divisions, countries, categories, brands and business units. The strategies have been co-created with the leadership team. The leadership teams have then owned and implemented, resulting in increased growth. Results: Growth rate raised to 9% p.a.. Market share gain across categories. Financial results ahead of ambitious plan. European Food Category. Crystallised the overall vision, current reality and strategy working directly with chairman. Result: Twenty years of decline reversed, growth of category. South Africa FoodCo Country Strategy across all division. Worked directly with Chairman, board members, category leaders. Result: profitable growth exceeding plan. Europe’s leading manufacturer for Foods Service. Defined European strategy, plus 10 country business unit strategies. Result: Growth of individual countries and European business. Maintained and strengthened #1 position. Global Retail Industry Strategy in global business services company. Defined across two day board meeting. Voted best industry strategy by CEO. Global Divisional Strategy ($4bn division), global business services company. Result: now #1 division in global company.